The combination of location by great beaches, hiking, golf and snorkeling along with a friendly staff makes this condominium special. Need easier to use blinds. Family oriented. Clean kitchen and good appliances. 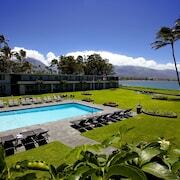 Look no further and take a look at our great range of rental properties in Maui!